It’s no secret that cats are amazing companions with a host of complex emotions and an ability to form special bonds with their caretakers. 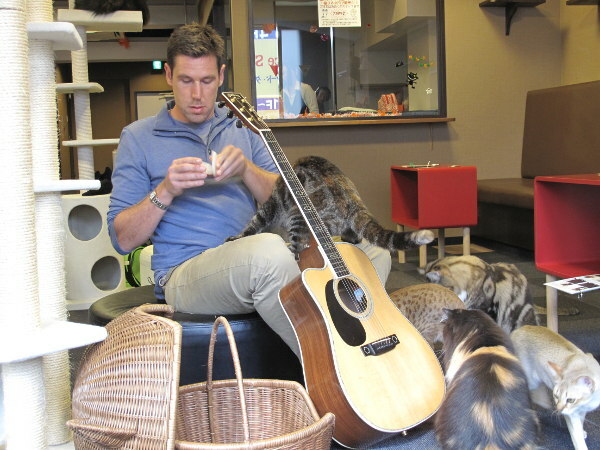 Last season, musician John Fulton made his way into the hearts of cat lovers through his travels across the country to give us a glimpse of all things feline on The Animal Planet’s Must Love Cats. The show brought fun cat facts, fascinating stories, and of course, John’s musical prowess. Last season, our hearts were won as we learned about cat poo coffee on the west coast, saw Garfield’s birthplace, and admired fire-rescue felines. The show developed quite a fan following, all of whom are impatiently waiting for the next season. Wait no longer, Must Love Cats fans, the new season will begin Saturday March 10th at 8PM (ET/PT). This season proves to be bigger and better than the last as John explores phenomenal kitty stories not only in the U.S. but also ventures overseas for two international excursions. Get ready for touching emotional stories of cats rescued from the throes of environmental disasters, incredible advances in the world of kitty medicine, intriguing feline art, and a way to connect with cats afar. And don’t forget about John’s famously entertaining “kitty ditties!" Be sure to join John on March 10 as he enthusiastically shares some incredible feline stories with us. Kaitlyn leads a double life as a graduate student in biochemistry and a vegan blogger, environmentalist, and budding animal rights activist. In her spare time she's been known to lift a weight or two, sport a tie dyed shirt, and put in some work behind her camera. Follow her vegan journey through her blog The Tie Dye Files.